Stephen has been lecturing in Canterbury for over thirty years – since the early 1980s, and among those who were at the farewell presentation yesterday evening were a few of his former students who are themselves well-respected academics in their own right, including Professor Kevin Ruane who is one of Stephen’s colleagues in the department. Kevin Ruane made the farewell speech, following Dr Keith McLay’s extremely interesting paper on the conduct of European warfare in the 18th century. Apologies to those who would like to have had a summery but I would suggest that you consult his book: Reassessing The British Way in Warfare: Strategy and Tactics during the Reigns of William and Anne (London: Bloomsbury, 2015). To return to Kevin’s speech, he reminded colleagues and others present that Stephen’s reputation as a lecturer in early modern English social history is legendary, and that for many former students the words ‘Rye’, ‘hearth’ and ‘tax’, and perhaps even more ‘dearth’ are enough to conjure up the figure of Stephen in full flow as a charismatic speaker. This aspect of Stephen’s academic career is obviously extremely important regarding his ability to inspire students with his love of history, and the need to study the lives of those below the elite to understand their economic and social world, and thus society more broadly. However, his research is also significant, because Stephen, as an economic historian, has worked extensively on agriculture and trade in early modern Kent and east Sussex. I’m guessing this began with his doctoral thesis on Rye under Joan Thirsk at Oxford. Yet he is probably much better known for his work on land holding and land use, using the scot books of the Level of Romney Marsh, social unrest in rural society, especially in north Kent, and the trade in cereals between Kent and London, using the various port books. The key common factors are Kent – the role of local and regional history, and local (as well as national) archives – the value of under-studied primary sources, and the knowledge to be able to deploy these successfully. 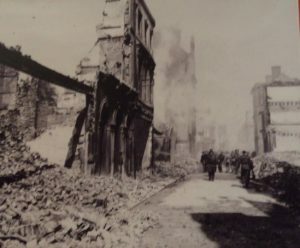 Destruction in Canterbury city in June 1942. A further aspect of Stephen’s career that links him to the ethos of the Centre, apart from being one of its founders, was his role in the early 2000s as a member of the Executive of the Romney Marsh Research Trust. The Trust had been founded to bring an interdisciplinary approach to the study of all aspects of the marshes, from geographical to biological to historical, and to involve both academics from the various disciplines and the general public who were interested in the marshes’ development from prehistory to the present day. Although no longer in existence, during the time Stephen was involved the Trust was very active holding conferences and guided walks, funding research projects, creating an extensive website of Trust activities and research findings, and publishing newsletters and multi-authored books. Indeed, Stephen was one of the editors for Romney Marsh: Coastal and Landscape Change through the Ages, Oxford University School of Archaeology, Monograph 56 (Oxford, 2002). Consequently, the Centre has ‘lost’ one of its principal local and regional historians, but hopefully he will now enjoy a long and pleasurable retirement. Now briefly before I turn to a progress report on Dr Diane Heath’s ‘Envisioning the Canterbury Cathedral Crypt Creatures’, I thought I would just mention the two Centre conferences coming up this month, both taking place in Old Sessions House. Firstly, on Saturday 3 June we have Dr Martin Watts chairing the half-day conference on ‘The Baedeker Raid on Canterbury – 75 years on’ featuring Kevin Ruane, Paul Bennett (Director of Canterbury Archaeological Trust) and Jordan Newton, a final year undergraduate at Christ Church who is using material from his independent study for his talk. There will be an exhibition of photos in the foyer of Old Sessions showing the devastation in Canterbury. Cressida Williams of the Canterbury Cathedral Archives and Library is providing the exhibition and again this demonstrates the way Christ Church works with partners locally and regionally. There is still space, so if you want to come along to Old Sessions House between 9.30 and 10.00 on Saturday morning with £8 (£5 full time student/unwaged), I’ll be happy to see you. All the spaces on the afternoon walk have now gone. 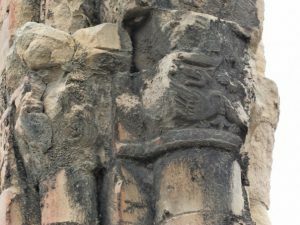 Thought to be a carving of a pelican that was somewhere at Canterbury Cathedral until its removal after the Dissolution. It was rescued from Deanery Farm, Chartham, and is now in the Canterbury Heritage Museum. Secondly, a fortnight later on Saturday 17 June the Centre is holding a one-day conference on ‘Tithe through the Ages: the Historian’s View’, which, too, will be in Old Sessions House. We are exceedingly fortunate to have several experts on tithe who have used these records to explore a range of social and other issues across the centuries. Among these scholars are the internationally known Professor of Medieval History from the University of Leicester Professor Chris Dyer and another medieval specialist Dr Ben Dodds, who lectures at Durham University. Dr Paula Simpson, from Cambridge, is currently working on her book about 16th-century tithe disputes, and, for the early modern session, she will be joined by Stuart Morrison, a doctoral researcher at the University of Kent. Dr John Bulaitis, who I am sure is known to many in Kent, will examine tithe in the modern period and our conference will begin with a talk by Elizabeth Finn on what was tithe and how did it change through the centuries. 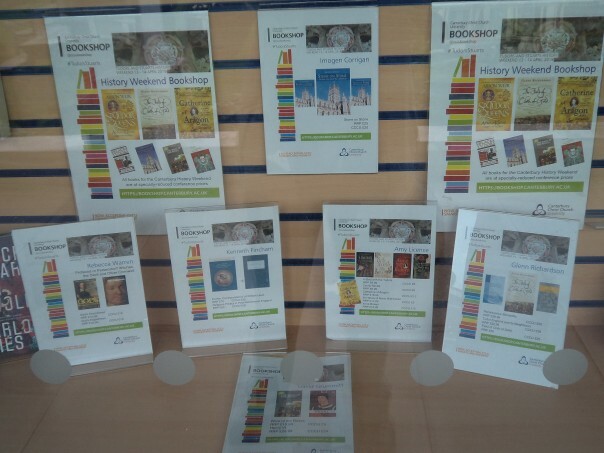 Elizabeth is an archivist at the Kent History and Library Centre at Maidstone, again known to many in the county. There are still places available so please look at the webpage: www.canterbury.ac.uk/tithe or phone 01227 782994 or email artsandculture@canterbury.ac.uk or come on the day, tickets are £16/adult or £14/full-time student/unwaged and I’ll similarly be delighted to see you. 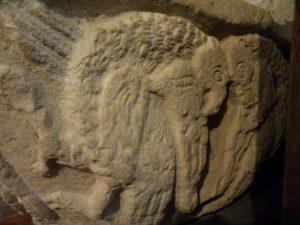 Dragon in the infirmary ruins, Canterbury Cathedral. Now what you have all been waiting for, the update on Diane’s Cathedral Crypt Creatures project. 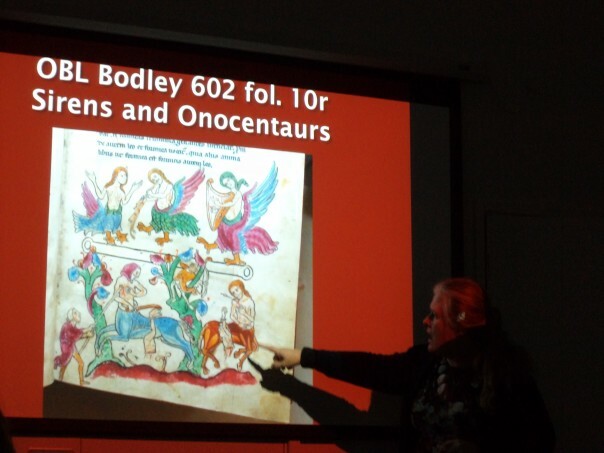 To begin, Diane has been in email correspondence with Dr Chris Pallant, Senior Lecturer in Film Studies about whether ‘animations of projection-coloured reliefs (taking inspiration from medieval gilded and illuminated bestiaries) might be feasible’. For, as Diane explains, such animation would permit the animals’ (and hybrids’) to ‘tell’ their reactions to the martyrdom and miracles of Becket, and this use of emotional engagement would resonate with Anselm’s ideas and current thinking on how to engage very different groups in 21st-century society. These ideas have sparked off others in terms of working with Heather Newton, Head of Conservation at Canterbury Cathedral, and ‘The Canterbury Journey’ team, and as well as an open lecture and workshop (see below), this project has the potential to attract national funding. However, to return to more immediate considerations, the first steps are to hold a public lecture on the evening of Friday 8 September, venue and exact time to be confirmed, but it will be given by Professor Sandy Heslop (University of East Anglia) and an expert in the field, who will discuss ‘Anselm and the Formation of Canterbury Cathedral Crypt’. Then on the Saturday, there will be a workshop, probably in the Precincts, that, as well as a visit to the crypt and a roundtable discussion, is likely to feature presentations by Diane Heath, Sandy Heslop, Jayne Wackett, Chris Pallant and the Canterbury Journey team. From the results of this bringing together of the various interested parties, it should be feasible for Diane and Chris from Christ Church with others to start constructing one if not more grant applications. Such a very exciting prospect dovetails beautifully with Diane’s academic expertise – the medieval bestiary, as well as her interest in engaging people of all ages and interests in these fantastic carvings of creatures. For not only can they be found in the crypt, but also in the ruins of the infirmary chapel, in the cloisters, under the treasury and on the south side of the cathedral. When more details emerge about this lecture and project more broadly, I’ll report back, but for now I shall look forward to meeting some of you on Saturday.